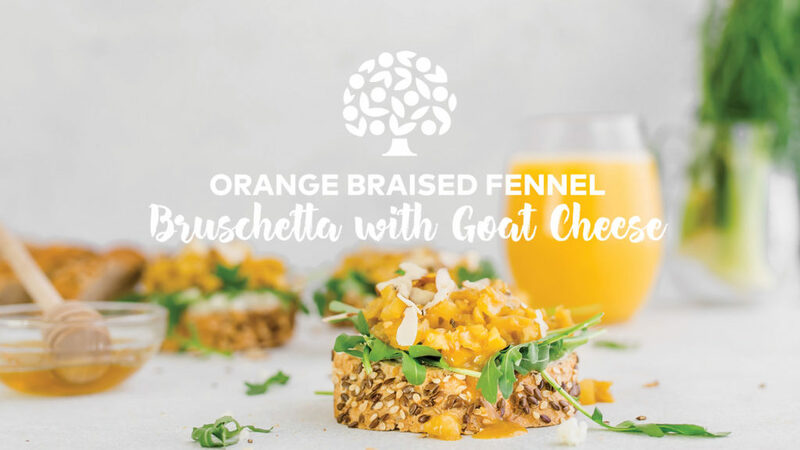 Simple and delicious, our Orange Braised Fennel Bruschetta with Goat Cheese serves up a ton of vitamins! The fennel is full of vitamin C, potassium, and manganese. The arugula is loaded with vitamin K, iron potassium and magnesium. All these nutrients work with 100% orange juice to support bone health and electrolyte balance for proper nerve function. 1. Core, remove tops and dice fennel. 2. Chop almonds in a food processor and set aside. 3. Mince garlic in food processor. 4. Sauté fennel with garlic and one tablespoon olive oil for five minutes or until browned. 5. Deglaze pan with orange juice, scraping brown bits up to incorporate into liquid. 6. Add chicken broth and black pepper, bring to a boil, and reduce until liquid is almost fully absorbed, approximately 5-10 minutes. Let cool. 7. Slice baguette into ¼ inch slices and toast. 8. Spread with goat cheese, top with fennel mixture and chopped almonds. Drizzle the remainder of the olive oil, the honey and top with basil and a few arugula leaves.